Continuing the work of its previous annual Digitisation in Cultural Heritage surveys (Core Survey 1 & 2), eNumerate has published the findings of its latest digitisation study. The eNumerate Digitisation in Cultural Heritage Report 2015 analyses data from over 1000 libraries, archives, museums and other institutions to paint a comprehensive picture of the current digitisation landscape in Europe. It explores a wide range of topics; from digitisation expenditure to preservation and access, discussing areas of growth and identifying opportunities. Survey data reveals 84% of institutions now hold a digital collection of some description, whether that be purely digitised material or combined with born digital elements. The benefits of digitisation are being seen and investment in digitisation is increasing, despite budgets cuts. On average 23% of European collections have been digitised, with Museums leading the way with the highest proportion (31%) up from 24% in the 2014 survey (Core Survey 2- CS2). However at the other end of the scale, only 13% of record office/archive collections and 19% of library collections have been digitised. This is possibly down to the vast amount of records these institutions hold, which could result in a longer digitisation process. 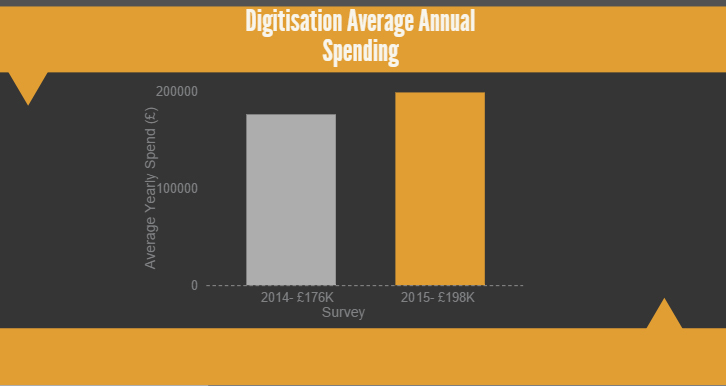 Annual expenditure on digitisation is also up, with organisations now spending on average £198,565 (€276,471) per year (up £22,000 from CS2). The breakdown of spend is very similar to CS2, implying that expenditure remains consistent. The majority of funding (88%) for digitisation projects comes from internal budgets and nearly 75% is spent in-house. Also the number of institutions with a written strategy has risen by 5% up from 36% in 2014, implying an increased focus towards digitisation and creation of digital archives. Despite the upward trend in levels of digitisation, the report suggests a large percentage of collections are not thinking long term. In terms of international standards: 47% still do not have long term preservation strategies for their digital archives. One exception though is national libraries – 90% of which have digital archives that meet global standards. As mentioned previously, the number of organisations with a written digitisation strategy is up. There is still a large discrepancy though between the number of digital collections and the number of written digitisation strategies. Especially if we look at the fact that 84% of institutions have a digital collection of some description, but only 41% have a written digitisation strategy. This suggests an inconsistency and that a large number have no formal policy for extending and managing the collections they hold. Even though there has been a rise in investment, funding resources in the cultural heritage sector are still limited. By having a long term strategy, institutions can have a more consistent approach – resulting in the best use and prioritisation of resources. The report suggests that 55% of descriptive metadata is unavailable online for general use. This implies that a large amount of records are virtually unsearchable because the associated metadata is not online. This could result in collections not being used to their full potential or even being found at all. By having related metadata online, documents/records are easier to locate via a digital archive and searchability through sites like Google can also be boosted. Though it is worth noting, that libraries ‘stand out in offering access to their online catalogues.’ On average, 68% of their associated metadata is available online for general use, this is perhaps unsurprising due to the nature of materials they typically hold. The report reveals that 51% of records are only available for staff use and 41% of data is available to archive visitors. This may mean that the proportion accessible for general use is even less. It is interesting that more data is not made publicly available, suggesting that the primary reason for digitising a collection is not for more commercial gain or for public use. So why are Institutions Digitising? For those questioned, academic research is the most important reason for making records publicly available through digitisation, with sales and commercial licensing the least important. For the majority of our clients, it is a similar story. Their goals are to preserve valuable archives and make them more accessible, rather than generate revenue. Libraries historically collect text based analogue resources, but eNumerate report data reveals that 80% now collect text based digital materials, such as e-books, as well. This means libraries are working to develop a broader collection. One notable statistic is the sharp rise in the number of institutions that collect born digital heritage. This has risen by 7% since the last survey, from 53% to 60%, showing that it is increasingly popular to collect born digital materials. These figures reflect the trend towards digital preservation and an increased focus on digital archives. By having a rich mix of digitised items in various formats, a collection is more likely to be utilised. If you would like to find out more, you can find the full report here or check out our 2013 and 2014 report summaries.